These days, motorists can invest in a vast array of car protection products to ensure that the beauty and integrity of their rides are preserved for the miles to come. Drivers across Idaho are now taking action to prepare their vehicles for the winter season, which for many people may include our LINE-X services. EPSCO Powder and Industrial Coatings is here to serve as your trusted team for industrial powder coating services, media blasting, and LINE-X spray-on applications, and we’re happy to provide assistance to anyone in need of quality protection. One question we often field here concerns whether or not LINE-X is worth the investment. While more costly compared to our powder coating services, a single LINE-X application can provide a lifetime of protection and service. Today, we’ll highlight a few groups that can best benefit from this industry-changing product. If you’re ready to invest in protective car sprays or high-quality truck accessories, be sure to stop by our shop on W 37th Street today! Plumbers, exterminators, and landscapers, all provide very unique services, yet each working professional relies on one tool to perform a majority of the heavy work — the truck. Hauling concrete, paint, or any other materials can seriously scuff up the bed of your vehicle, worsening over time until rust begins to appear. Instead of fighting off the inevitable onset of corrosion and degradation, industry professionals can instead turn to our LINE-X sprays. EPSCO Powder and Industrial Coatings of Boise is here to deliver powder coating and LINE-X services to local drivers in need of all manners of vehicle protection. 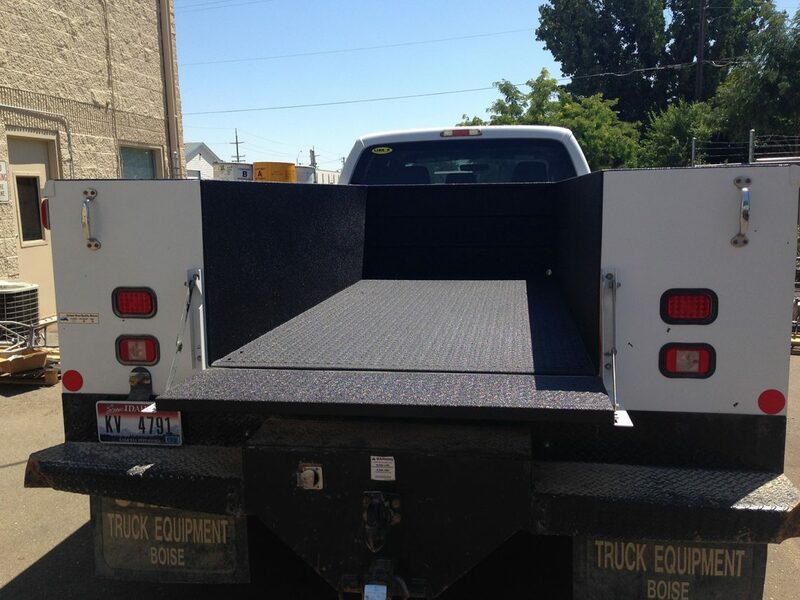 Whether you’re hoping to protect your private work truck from stains and scratches, or you are in need of protective solutions for an entire fleet, be sure to reach out to our experts for a consultation! Individuals seeking to hit the open road can benefit from the peace of mind provided by our comprehensive line of LINE-X products. It is essential to ensure that your vehicle is protected from the outside elements, as small leaks can result in costly repairs. The roof components of your RV should be inspected often, or in some cases, covered with a LINE-X spray for complete protection. This service can also apply to wheel wells, fenders, steps, bumpers, ladders, frames, and nearly every other component. Many Boise residents are surprised to learn that EPSCO can provide spray-on services for a wide range of parts and surfaces. Be sure to contact us to learn more about our high-quality approach and modern technology! From the hull of your boat to the equipment on the deck, protection from rust and impacts can prove very valuable for those spending their time on the water. Boating enthusiasts looking for added peace of mind from leaks can invest in LINE-X sprays for rugged protection that resists all manners of damage while keeping H2O out. Heading down to the C J Strike Reservoir? Be sure to test out our LINE-X service on a vital component before protecting your entire craft! Those looking for the best protection in the industry when taking on the trails can apply the same protection offered by this superior truck bed coating. LINE-X sprays are designed to offer superior conformity, flexing to changing situations, while retaining the integrity of the surface for solid protection. Scratches from rocks, boulders, and unexpected slides can quickly hurt the beauty of your 4×4 machine, and random factors (watch out for nearby branches!) can leave the exterior open to rust and further damage. Remember that versatility is key for drivers looking to get the most out of their car protection. LINE-X bedliners can be changed to adhere to the entire truck, providing a rugged look and a lifetime of defense from the most challenging lines. If you’re a good friend and you happen to own a truck, you may be the go-to person on the receiving end of a call for moving help this weekend. Certain individuals have been known to begin turning this into a lucrative pastime, taking donations for their hard work. Constant use can put a lot of strain on the bed of your truck. Even movers who take special care will likely not be able to prevent the full scope of scuffs and dents caused by heavy furniture. Couches, tables, entertainment centers, and other large home essentials may leave your vehicle looking a lot worse for the wear. LINE-X may prove to be a long-term solution for movers of all skill levels. Frequent travelers and snowbirds can also benefit from this coverage. Individuals who use their vehicle merely to get from Point A to Point B (and the occasional Point C) may not consider LINE-X sprays for their transportation needs. In some cases, drivers like to keep their trucks completely stock. If you are not interested in aftermarket upgrades like our truck accessories or spray-in bedliners, then LINE-X will likely not be worth the investment. Drivers who desire a high-quality look for their daily commute, however, may find more value. EPSCO Powder and Industrial Coatings can deliver the perfect result for applications of all sizes. Whether you’re seeking LINE-X as a bedliner or a complete protective solution, our experts will be able to deliver affordable and long-lasting results. Contact us today, and be sure to stop by our LINE-X authorized shop in Boise for assistance!